Welcome to artist Susan Block’s web page. We hope you are swept away by the artistry you find here. 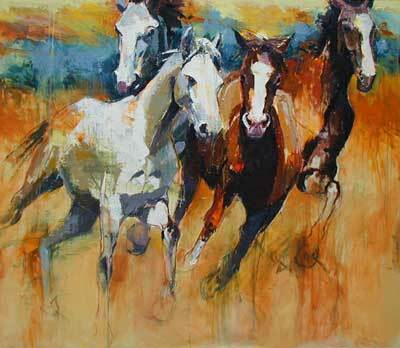 Susan Block paints to make real an American Horse dream. The paintings are about energy and an invincible spirit. The works are a metaphor for a people and a way of life. The art suggests honor and courage, spontaneity and beauty. Ms. Block mixes all types of media with oil paint to create her life size paintings on canvas. 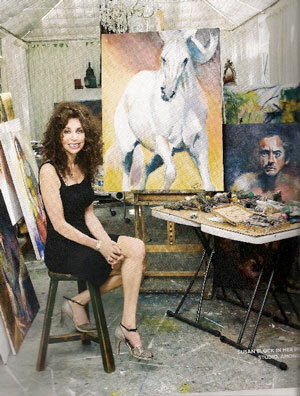 Visual Artist, Susan Block, has shown her paintings all over the United States and in Europe. Susan Block is also a Chicago stage actress. Susan Block, painter and actress, has appeared in over thirty stage plays, been nominated for a Joseph Jefferson award for best actress of the year, and has had more than twenty five one woman painting shows.